Seven months later, Altman was traded for Craig, a deal that helped transform the Cardinals into World Series champions in 1964. On Nov. 4, 1963, the Cardinals sent Altman and pitcher Bill Wakefield to the Mets for Craig. The deal initially appeared little more than a change of venues for a pair of underperformers _ Altman and Craig _ looking to revive their careers. Craig was 5-22 for the 1963 Mets and he lost 18 consecutive decisions between May 4 and Aug. 4. The Mets were shut out in nine of Craig’s losses and he lost five times by 1-0 scores. The Cardinals acquired him because he could start and relieve, general manager Bing Devine said, and his 3.78 ERA in 1963 indicated Craig was a better pitcher than his won-loss record showed. “Craig gives us stability and maneuverability in our pitching,” Devine told United Press International. Said Craig to the Associated Press: “I knew I’d be traded. I was praying it wouldn’t be to another second-division club. I felt I suffered enough … I want to thank the Mets for dealing me to a good club. The Cardinals have the best-hitting team in the league and should be a contender for many years. Craig’s versatility for the 1964 Cardinals was reflected in these statistics: He was third on the club in games pitched (39), third in saves (five), fourth in starts (19) and fourth in innings pitched (166). His best work for the 1964 Cardinals was out of the bullpen. Overall, he was 7-9 with a 3.25 ERA. In relief, he was 2-1 with a 2.20 ERA in 20 games. Altman, the right fielder for the 1963 Cardinals, had been expected to provide power and run production after being acquired from the Cubs. He hit 27 home runs for the Cubs in 1961 and 22 in 1962, and was named an all-star both years. With the 1963 Cardinals, however, Altman was a streaky hitter who failed to produce consistent power. He hit .274 with 18 doubles, nine home runs and 47 RBI in 135 games. After beginning his Cardinals career with great promise _ Altman had eight hits in his first 16 at-bats _ he went into an 0-for-27 slump in May. Altman’s inconsistency was reflected in these statistics: He hit .370 for St. Louis in April, .184 in May, .305 in June and .226 in July. 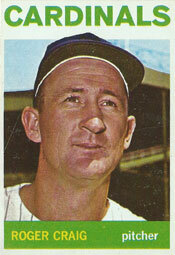 Altman hit .230 for the 1964 Mets and duplicated the home run and RBI totals (nine and 47) he had for St. Louis in 1963. After returning to Chicago and playing for the Cubs from 1965-67, Altman revived his career in Japan. In eight seasons in Japan, Altman hit 205 home runs, including 34 for Tokyo in 1968 and 39 for Lotte in 1971.